Description 5 Rounds, 4 Sections, Game/30. $E.F.$15 on-site. See Publicity flyer (below) for discount info. Round I starts 10 AM. 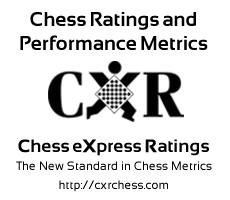 K-3 and K-6 sections are CXR-rated (see: www.cxrchess.com). K-8 and K-12 sections are USCF-rated (see: uschess.org). Directions After entering the school, head for the cafeteria. NOTE: Chess sets (board/pieces/clocks) will be provided for your use during the tournament.